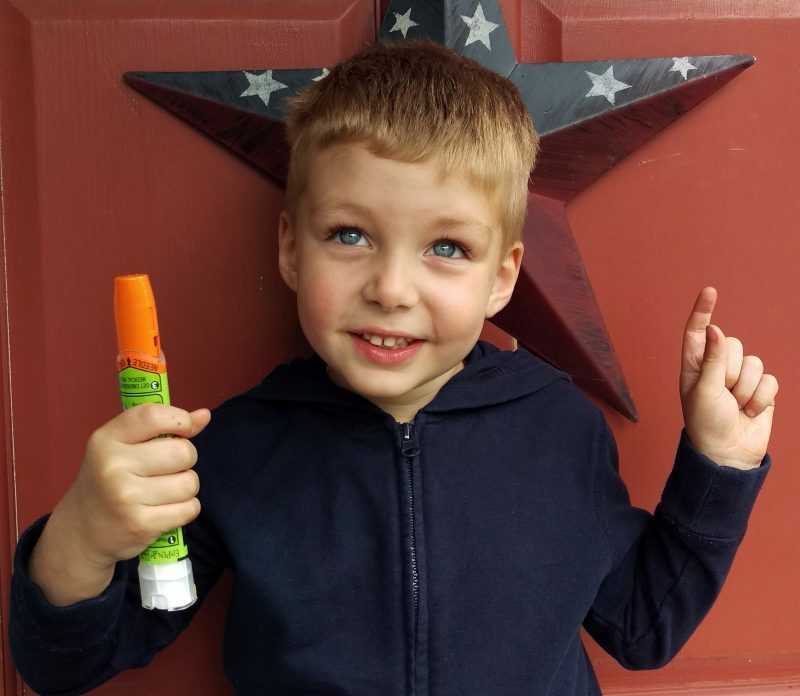 3-year-old Sam Plant with his first EpiPen. A year and a half ago when we first met with Dr. Ravi Karnani to discuss Sam’s growing list of allergies Dr. Karnani told my husband, Chris, and I that if we were ever in doubt about a reaction, not to wait, just use Sam’s EpiPen and get him to the nearest ER. Knowing that we often travel to visit family, he also advised us to always be aware of the location of the nearest hospital. Even with incredible diligence, sometimes unexpected things happen and a few Saturdays ago I used Sam’s EpiPen on him for the first time. Every few weeks we visit my grandparents and have the same foods: pizza (ordered from the same shop), deviled eggs, and lemonade. This time, shortly after eating, Sam began to complain of his head hurting. This was not a “typical” allergic reaction for Sam, who usually begins to drool and whose breathing visibly slows before he vomits (which, thankfully, has only happened the 3 times, twice leading to the nut and seed allergy diagnosis). I knew he had eaten the same trusted things, and so began with the usual question for a 3 year old. Did he bump his head? But, before he could answer I could tell he was not feeling quite right. So, the next round of questions began: had he eaten anything we hadn’t seen? Had he somehow touched a food that is not Sam safe even though all of those are always secured well before his arrival? He said he hadn’t eaten anything but his food we gave him, and I knew he had been playing where I could see him. It all happened much more calmly than I expected, and before I knew it I was holding his EpiPen to his leg and counting to 10 as Chris got the car and prepped Bekah to stay with my parents while we took Sam to their local hospital. Again, Dr. Karnani’s advice paid off. We knew the location of 2 hospitals that were the same distance, but had already discussed which one we’d go to in an emergency. On our way there I called to let them know we were coming and when we arrived they had a bed set up with pediatric equipment ready for him. They monitored him for a few hours, and after no signs of a secondary reaction, he was ready to be released. 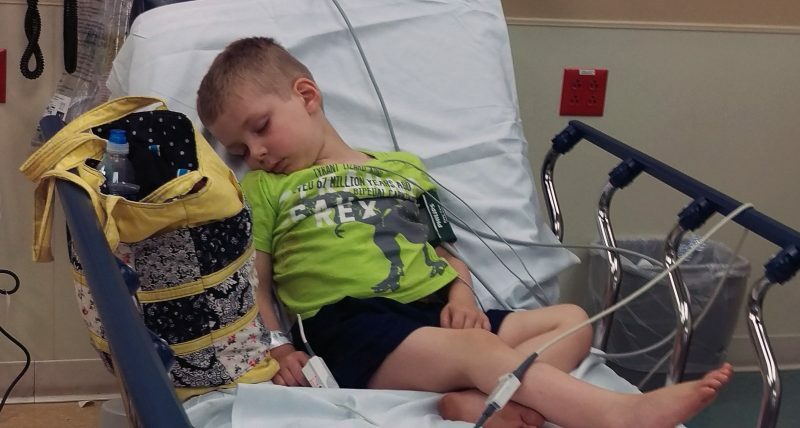 Sam was treated at Excela Health-Frick Hospital in Pennsylvania while visiting family. We never figured out what caused the reaction. The pizza shop has not changed their ingredients in the last 8 years (I called to check), the eggs have been made the same way for the last few decades, and the lemonade, well, it was lemonade. Our best guess is that when Sam dropped his pizza on the table (which we hadn’t even thought about at the time), there was the residue of something that contaminated it. Thanks to lots of pretending with the practice EpiPen, the support of Sam’s awesome pediatricians, and the words of Dr. Karnani, this event has simply reinforced an allergic-reaction truth: in the middle of a reaction, it’s not important to identify exactly what was the cause. If you aren’t sure, use the EpiPen, and get to the nearest emergency room. Oh, and if your food falls and it’s not on your plate, just don’t eat it.